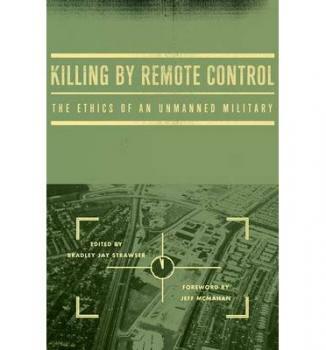 Killing by Remote Control: Ethics of an Unmanned Military is a new collection of academic essays edited by Bradley Jay Strawser, a philosophy professor at the US Navy Postgraduate School in California. Strawser, as readers of this blog may remember, was interviewed by The Guardian last year and quoted as saying in relation to unmanned drones: “It’s all upside. There’s no downside. Both ethically and normatively, there’s a tremendous value.” Famously, Strawser argues that the US has a moral duty to use drones. I should emphasize that Strawser (as a supporter of the use of armed drones) does not suggest these are insurmountable moral problems but he does agree there are issues to be investigated. Like most collections of essays, some are better than others. In his essay ‘Just War Theory and Remote Military Technology: A Primer’, Matthew Hallgarth a former US Air Force major who, his biography tells us, taught ethical theory for many years, obviously comes from the ‘guns don’t kill people, people kill people’ school of thought. Hallgarth comes to the rather shallow conclusion that there is no moral difference between an armed Reaper drone and a kitchen knife. Time, I think for him to quit the moral philosophy business. Zack Beauchamp and Julian Savulescu, argue that more warfare through drones is in fact a good thing claiming that the “wars that states don’t fight are the ones they most ought too.” (p114) The authors contend that ‘casualty aversion’ and lack of public support means that certain countries are reluctant to get involved in humanitarian wars. The advent of remote drones, the ‘risk free’ nature of this type of warfare, and that fact that states will not need popular support to get involved may mean we will see more ‘humanitarian wars’, which they contend would be a good thing. This is nonsense and the idea that drones can be used to monitor or prevent serious human rights abuses has rightly been challenged before. In my opinion Robert Sparrow’s ‘War without Virtue?’ and Rebecca Johnson’s ‘The Wizard of Oz Goes to War: Unmanned Systems in Counterinsurgency’ are the two best essays in this collection. Sparrow, who is a Fellow at Monash University in Australia and a founding member of the International Committee for Robot Arms Control writes powerfully about how the use of unmanned systems has a negative impact on the required military virtues of courage, loyalty, honour and mercy. This is an unusual critique of remote warfare and one that deserves more attention. Counting the Dead: The Proportionality of Predators in Pakistan, by Avery Plaw of the University of Massachusetts examines the on-going dispute around the amount of civilian casualties caused by drone strikes in Pakistan. After examining various datasets Plaw concludes that drone strikes in Pakistan are not killing ‘a disproportionate number of civilians in violation of the standards of Just War Theory and International Laws of Armed Conflict.’ Shockingly Plaw completely omits throughout the whole of his essay that the laws of war (International Humanitarian Law) do not apply to the situation in Pakistan, rather International Human Rights Law applies. It is astonishing and, in my view, completely undermines any of his conclusions, that he fails to even mention this basic fact over twenty-five pages. The two final essays in this collection focus on the growing autonomy of drones, to which there is now a growing challenge. I shall examine them as part of a separate post about this specific aspect of the future use of drones in the near future. Overall Killing by Remote Control gives an interesting insight into the ‘pro-drone’ side of the moral arguments surrounding the growing use of drones. The most common line in the book – one that occurs in some form or other in almost all of the essays – is the constant argument that ‘X’ moral problem is not new or exclusive to the use of drones. The reality is that drones and remote warfare do incorporate a large number of moral problems and no matter how many times proponents protest that this particular issue is not just a moral problem for drones, the fact that drone warfare bring these various moral problems together, makes drone warfare a real moral problem.